Fake diamonds and real diamonds are very similar these days and it is hard to tell one from the other. Fore, some man-made gems look authentic and expensive. 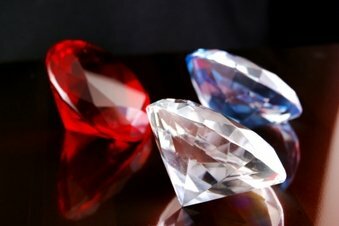 The grading system, however, makes it easier for buyers to tell the difference between counterfeit gems and authentic gems. You can tell an actual diamond from its properties such as, internal inclusions and external blemishes. Fake diamonds are man-made or lab-created gemstones. They are usually synthetics or simulants, glass,and cubic zirconia. Yet, some can be made to look so authentic, unless, you test them as stated above, you could buy a counterfeit diamond and never know it. Real diamonds is hard, it rates a "10" on the Mohs scale, because of its hardness, it can scratch glass and other gems. It has a certificate of authenticity. When buying diamonds, you can ask for the certificate of authenticity from a reliable grading system authority such as, Gemological Institute of America (GIA), Jewelers Association of Australia, or an independent appraiser who is affiliated with a professional organization like the American Society of Appraisers. This is especially important if you are buying a diamond on the internet. You can look through a diamond to see if it sharply bends the light that passes through it. Glass and quartz bend the light less and they sparkle less, no matter how nicely glass and quartz are cut. If a gem is not mounted, then you can turn it upside down on a piece of newspaper to see if you can read the print. If you can see the print or distorted black smudges, then the stone is not a diamond, unless, it is disproportionately cut. If that's the case, you can see print through authentic gems. 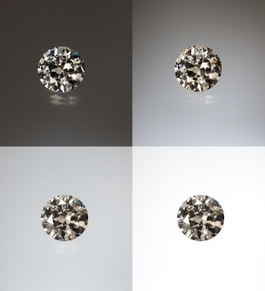 If the gemstone shows any sign of double refraction, then it may be a Moissanite (silicon carbide), a gemstone that is so similar to a diamond, until, jewelers can't tell the difference. If your diamond is mounted, you will not be able to see the bottom looking directly from the top. However, if your gem is unmounted, then you might want to draw a small dot with a pen on a piece of white paper. Place your unmounted diamond over the center of the dot and look directly down on it. If your gemstone is not genuine, you'll see a circular reflection in the stone. It is important to observe the reflections of a diamond. An authentic gem's reflection is gray, if you see a rainbow reflection, the diamond is either low-quality or a counterfeit. There are other things you can do to tell alot about your gems. 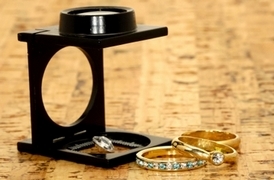 You might want to buy a diamond tester, they are readily available and can quickly indicate their differences. Weigh the diamond, a cubic zirconia weighs approximately 55% more than a gem of the same shape and size. You can use a carat or gram scale to compare the diamond to see if they are fake diamonds and real diamonds. The setting and the mount of a diamond should be checked, an authentic gem will not be set in a cheap metal. A stamp inside the metal will indicate actual gold or platinum (10-18K, 585, 750, 900, 950, PT, Plat) and that the center gemstone is authentic. A "C.Z." stamp will give away that the center gemstone is bogus. Many gems will exhibit blue fluorescence, if you were to put them under an ultra violet or black light. The presence of a medium to strong blue confirms that it is authentic. However, the absence of blue does not mean that these are fake diamonds, it could be a better quality gem. If a gemstone show a slight green, yellow, or gray fluorescence under ultraviolet light, it might be Moissanite, a silicon carbide used as a gem simulant in fashion and in science applications. They disperse heat quickly and won't heat up, when you test them with a heat probe. The test takes about 30 seconds and often done free of charge. It doesn't hurt the diamond the way other ways of testing will hurt it. You can have the diamond x-rayed, real diamonds are radiolucent. They don't show up on an x-ray like glass, crystals, and cubic zirconium. Glass, crystals and cubic zirconium have slighty radiopaque qualities. Lab-grown gems and Cubic Zirconia do not have imperfections and can pass all of the other tests. They are found at mines, with small imperfections or inclusions that can be seen through a jeweler's loupe. If you put an actual diamond in water, it will sink, but fake diamonds will float. You can put the diamond in your mouth and breathe on it. If it stays "foggy" for 2-4 seconds, then the gemstone is not authentic. Real diamonds will have cleared before you looked at it. However, be fore warned, some jewelers cap cubic zirconium bases with the authentic gems which will clear.